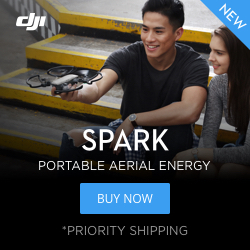 I had my DJI Phantom 3 Standard for quite a few months before sending it to Craigslist to pay for the Spark. In those months, my wife had never shown any interest in flying it and to be fair, I had no interest in her crashing it either. But once I finally received my DJI Spark, my thoughts were completely different. I watched a lot of the launch videos from DJI as well as a ton of review from famous YouTubers about how easy it was to fly. Julien Solomita even had a video of his mom flying it. This is one of the things that drew me to the Spark. Most people aren’t professional photographers or YouTubers or anything like that. I’m not either. The Spark is small enough to carry around and easy enough to take out quick, launch it, and take some fun shots. I took some time and really played with the DJI Spark. It took just a little bit of playing around to learn it’s little quirks and get used to the interface but I immediately fell in love. Katie had to have the opportunity to try flying this for herself. I have a feeling, even better than the crazy epic shots from above, the stunning vistas this drone can capture, the most important videos to me are going to be specific to what the Spark can shoot. I put together the video below just having a little fun around the house. But watching Katie try out the Palm Launch for the first time is really fun. Watching Amelia buzz around the street with her little cart is something we’re going to cherish. And it’s all thanks to this little Spark, how fun it is to use and the cool shots it can get all by itself.